The goal of Georgian Bay Forever was to identify and assess a variety of engineered structural solutions, and determine the most effective and suitable configurations for the task of maintaining the water levels of Lake Michigan-Huron and Georgian Bay within a prescribed historic range at all times. The project was called : Managing Water Levels in the Great Lakes: The Search for New Solutions . 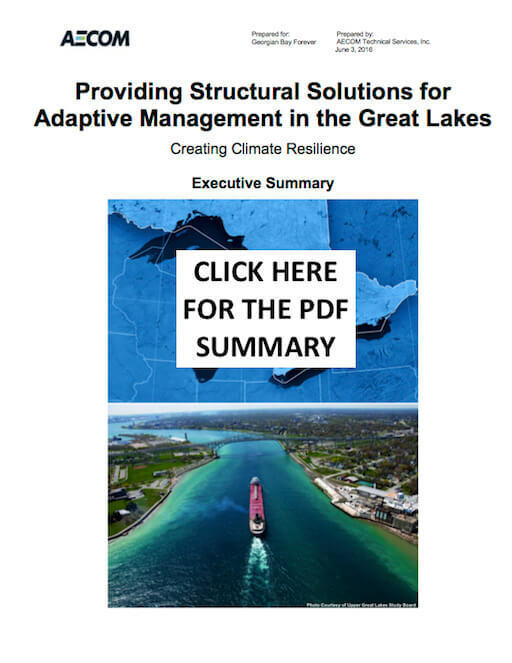 Click here for AECOM's summary report of findings entitled " Providing Structural Solutions for Adaptive Management in the Great Lakes" (pdf format) or continue reading. The levels of Lakes Ontario and Superior are already controlled to achieve this goal, as is the St. Lawrence River. A series of locks, dams and flow control mechanisms have been put in place over the years to keep the water levels in these bodies stable. In fact, the IJC has been controlling the levels of Lake Ontario and the upper and lower St. Lawrence River since 1960. Many other major water systems have installed flow-management structures, including the Thames River in the United Kingdom, the tributaries surrounding the city of Venice in Italy, as well as the lower Don River in Toronto, the lower Mississippi River, and the Clinton and Black Rivers on the St. Clair system. In the case of Lakes Michigan and Huron as well as Georgian Bay, however, no such flow controls exist. Indeed 68% of our lakes’ renewable waters flow out unimpeded into Lake Erie and then immediately over Niagara Falls, with a further third lost to evaporation. Overall less than 1% on average is renewed by precipitation, surface water run-off, and inflows from groundwater sources. We believe that for these reasons our lakes need controls too in order to regulate the amount of water either held back or lost to outflows, depending on climate conditions. According to recent studies, this is the only way to reduce the extreme volatility from any shifts in water levels and manage the risks we face from such wild, unnatural swings. This will also restore more natural historic fluctuations and make the lakes less vulnerable and more viable over the long-term. GBF selected the renowned international engineering consulting firm AECOM to review and build upon prior flow regulation assessment work done by organizations such as the International Joint Commission (IJC) over the past 100 years, and to explore various state-of-the-art and emerging materials and technologies arising in the 40 years since the last engineering design work was done. Please find a summary of their work showing that climate resilience can be cost effectively added to the Great Lakes system through examples of structural measures currently in use in other parts of the world, and recommending that governments officially develop these types of solutions to provide adaptation tools to future water managers to protect our Great Lakes ecosystems and economies from detrimental climate changes. If you would like a full copy of the entire report, please contact the Executive Director at executivedirector@gbf.org or call at 990-880-4945 ext. 1. We are a small charity devoted to ensuring that the waters of Georgian Bay are thriving for future generations. We thank you for your support which enables these projects and more. We are ambitious and want to do so much more to investigate and protect against threats to the Great Lakes and The Bay. Please consider donating today.